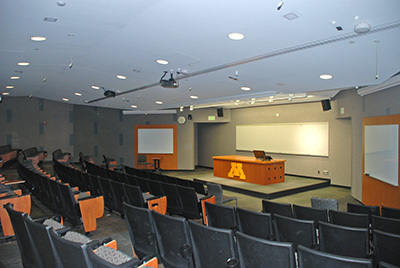 The IMA uses Keller Hall (KH) rooms 3-176 and 3-180 for most workshops and activities. Depending on IMA needs, IMA visitors and University of Minnesota departments are welcome to reserve the rooms for academic use at no charge. Room 3-180 seats 130 and room 3-176 is a small registration/reception room. The ECE Depot has chairs and tables available for rent and delivery. Reservations may be made up to three months in advance. The IMA reserves the right to cancel your reservations should our needs change. The IMA will not provide staffing or technical support for your event. Thank you for helping us to keep this room clean and secure. If you have any questions, please call the IMA at 4-6066 or email us at visit@ima.umn.edu. Failure to comply with these guidelines may result in an individual and/or a department being denied use of the room in the future. Capacity: Maximum capacity of KH 3-180 is 130 people. Equipment in KH 3-180: Your department will be held responsible for damaged or stolen equipment. Control room: The control room in the rear of 3-180 may be used for 35mm slide projections. For all questions and help with equipment in the control room, please contact UNITE (4-9533). AMX control panel: AMX contol panel has a touch screen. The AMX control panel controls three laptop inputs and video input to three LCD projectors. It also controls three LCD projectors, center mounted screen and audio. Touch the AMX control panel touch screen to turn on/off the LCD projectors. LCD Projectors: The room is equipped with three ceiling mounted LCD projectors. Connectors and AMX control panel are on top of the front desk. Overhead Projectors: The two overhead projectors in the room are available to you. Screens: The room offers three large screens. The AMX control panel controls three mounted screens. The AMX panel controls center screen. To raise and lower the left/right side screen(s) just turn on left/right LCD projector(s). Lights: All light switches are located and labeled on the left side of the front desk. Keys: Pick up keys in Lind Hall, Room 306 at the front desk up to two business days before your event. Only one set of keys will be issued so please designate a responsible party. Return the keys immediately after use. Food or Drink: Food and drink are not allowed in the lecture room. For refreshments, please use the hallway or reserve room 3-176.